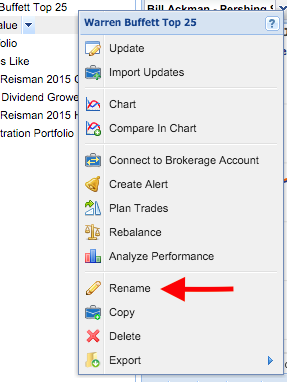 You can organize your portfolios into groups. 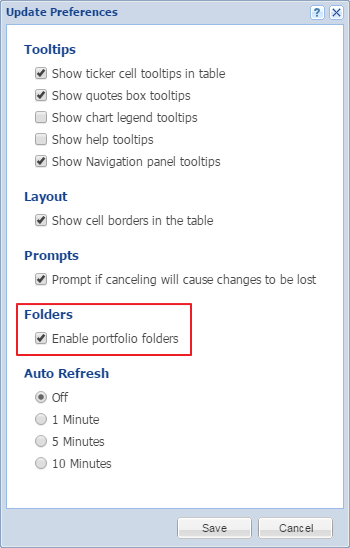 To enable portfolio folder grouping in order to organize your portfolios into folders, go to the ‘Settings’ menu in the toolbar and select the ‘Preferences’ item in the drop-down menu. 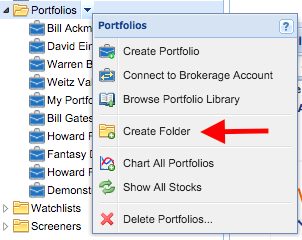 To create more portfolio folders, right-click either ‘My Portfolios’ or one of the portfolio folders and select ‘Create Folder’ from the drop-down menu. After giving it a name, it will appear under ‘My Portfolios’ in the Navigation panel. From here, you can just drag and drop the portfolios into the different folders. You can also drag and drop the folders themselves to rearrange the order. Now when you click ‘My Portfolios’ in the Navigation panel, you’ll be able to see the summary of each of the portfolio folder groupings displayed in the Table, as shown below.